Best customer service in Western Europe! 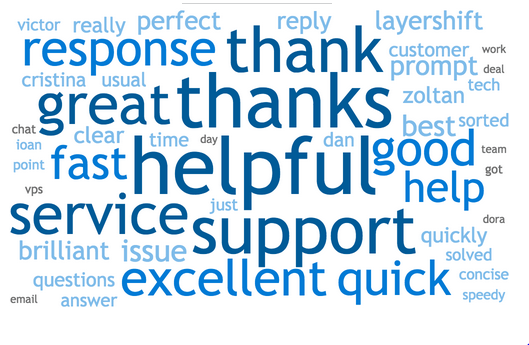 To find out we engaged an independent real-time feedback service called Nicereply to help us answer these questions, and for the last 3 years every time we assist a customer we provide a simple link to for their feedback. No complex surveys, no harassing phone calls, just an non-intrusive link where customers can rate our reply out of 10 and leave an optional comment. The important part is where that feedback goes, and because Layershift is founded on the very principles of exquisite customer service that feedback gets straight in front of the directors in real-time. This way we keep our finger firmly on the pulse and know immediately if even one customer feels that we’re letting them down! As I have the privilege to write this blog post, let me take a moment to say that everyone here at Layershift really appreciates this special recognition of our efforts. As anyone who works in customer service roles knows, it takes a Herculean effort from every last member of our team to achieve such an outstanding and consistently high level of customer satisfaction, and receiving acknowledgement for a job well done – even in the form of a simple thank you from our loyal customers – is a HUGE morale boost; knowing that those thank yous and notes of feedback have cumulated in the entire team receiving international recognition is amazing! It’s only natural that we want to rescue other less fortunate webmasters and developers from the clutches of… umm… let’s say "less energised" hosting providers. You can help us out on this mission by spreading the wonderful news now that Layershift’s support team have official recognition as the best in Western Europe! If as you’re reading this you’re thinking maybe your hosting provider keeps you waiting too long in your moment of need, or perhaps the assistance you receive from them is lacklustre and scripted, maybe you should get ready to use a provider who truly cares about your needs? Take a look at our range of hosting services and discuss your requirements with our friendly sales team; in most cases we can even include a free migration service to get you moved across as smoothly as possible.